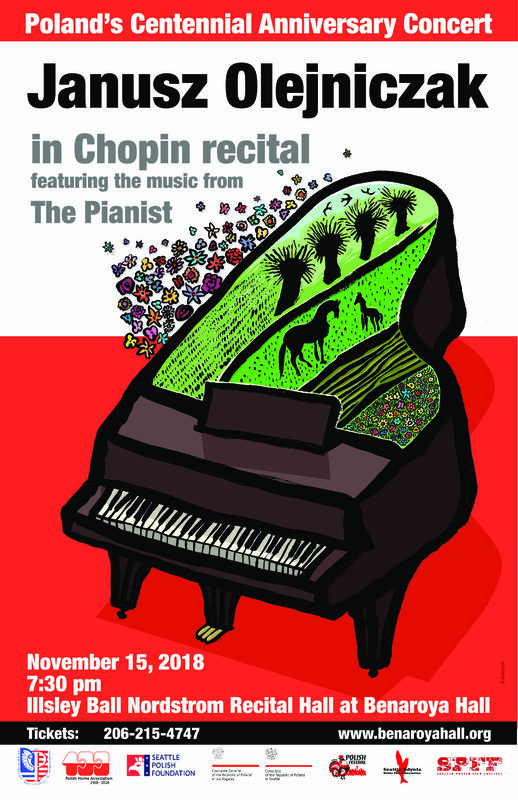 Highly acclaimed Polish Pianist, Janusz Olejniczak performs Chopin’s masterpieces in a piano recital commemorating the Centenary of Poland’s Independence and 100th Anniversary of Polish Home Association in Seattle. The program contains works performed by the artist in a movie “The Pianist” as well as Chopin’s Mazurka’s and Polonaise especially selected for the centennial gala concert. This one time only special event is not to be missed! Prices range from $36.50-$51.50 dollars. Janusz Olejniczak, born in Wrocław, studied in Warsaw and Łódź with Luiza Walewska, Ryszard Bakst and Zbigniew Drzewiecki, as well as in Paris and Switzerland with Witold Malcużyński. Graduated from the State College School of Music in Warsaw in 1974 in the class of Barbara Hesse-Bukowska, and continued his studies with Victor Merzhanov in Warsaw and Paul Badura-Skoda in Essen (1977–78). He was the youngest award winner at the 8th International Fryderyk Chopin Piano Competition in 1970, and award winner at the International Alfredo Casella Competition in Naples. Janusz Olejniczak performs in the leading concerts halls in Europe, the Americas, Asia and Australia, including the Berlin Philharmonic, Teatro Colón in Buenos Aires, Salle Pleyel in Paris, Tokyo’s Suntory Hall, Washington’s Lincoln Center, Carnegie Hall, Tonhalle in Düsseldorf, Concertgebouw in Amsterdam. For four years he has taught at the Music Academy in Cracow. He has also served in numerous piano competitions juries, and given masterclasses in Canada, Japan, Colombia, and at the Mozart Academy in Salzburg. His repertoire centers on the works of Chopin, Bach, Schubert, Schumann and Liszt. His interpretations of twentieth-century compositions have also been highly acclaimed, including Debussy, Ravel (Concerto in G), Prokofiev, Messiaen, Shostakovich, Henryk Mikołaj Górecki, Wojciech Kilar, and Witold Lutosławski. He is an avid chamber musician, and has appeared with orchestras conducted by Witold Rowicki, Andrzej Markowski, Kazimierz Kord, Antoni Wit, Jerzy Maksymiuk, Tadeusz Strugała, Charles Dutoit, Andrzej Borejko, Grzegorz Nowak, Jacek Kaspszyk, Marek Pijarowski, Marek Moś and others. In recent years he has also given concerts and recorded on historical instruments (Érard and Pleyel), often collaborating with the Orchestra of the 18th Century of Frans Brüggen. At the Chopin and His Europe Festival in Warsaw, he appeared with the Orchestre des Champs-Élysées under the direction of Philippe Herreweghe. Apart from an extensive Chopin repertoire (for Polskie Nagrania, Tonpress, Muza, Wifon, Opus 111, Camerata, Sony Classical, Selene, CD Accord, Bearton), Janusz Olejniczak has also recorded works by Rameau, Mozart, Schubert, Prokofiev, Kilar, Górecki and Lutosławski, Ravel and Shostakovich. In recognition of his outstanding musical achievements he has received eight Fryderyk Awards of the Polish recording industry, as well as the Officer’s Cross of the Polonia Restituta (2000) and the Gloria Artis Gold Medal (2005). Janusz Olejniczak has also recorded best-selling soundtracks for three famous movies: Jerzy Antczak’s Chopin: Desire for Love, Roman Polański’s The Pianist and Andrzej Żuławski’s La note bleue, additionally appearing in the latter as an actor playing role of Frederick Chopin. In 2015 he served on the jury of the Frederick Chopin International Piano Competition in Warsaw. He is associated with the Frederic Chopin Music University in Warsaw.